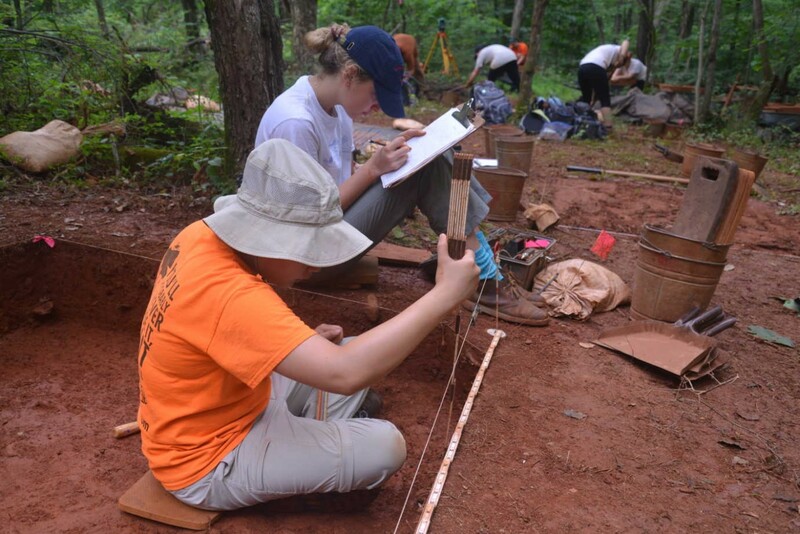 Students in the Monticello-University of Virginia Archaeological Field School record a profile of a five-foot excavation quadrat at Site 6, a domestic site occupied in the first quarter of the 19th century by enslaved agricultural laborers. Image courtesy of Monticello. Over several decades, the NEH has supported archaeological research and the development of new exhibitions at Thomas Jefferson’s Monticello, the World Heritage Site, museum, and research institute located in rural Virginia. These grants have had an outsized impact on the local economy as Monticello welcomes nearly 400,000 annual visitors, 93% of whom were from outside of Virginia. Fifty percent of them stayed in a hotel for at least one night, contributing no less than $13.1 million to the local economy. 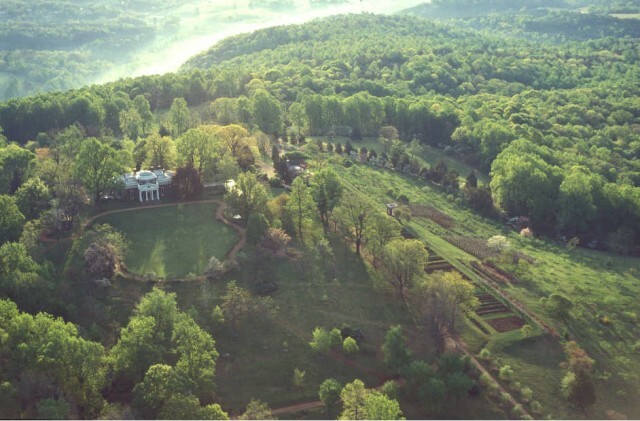 Jefferson built his iconic neo-classical mansion at the summit of a small mountain on the western edge of his 5000-acre Monticello Plantation tract. The eastern slopes of the mountain are today covered in forest, but in Jefferson’s day would have been cleared for agricultural fields and dotted with the houses of enslaved laborers. NEH has provided funding of archaeological research to rediscover this vanished plantation landscape. Image courtesy of Monticello. Beginning in the 1980s, the National Endowment for the Humanities funded archaeological research into the remains of Mulberry Row, the workshops, quarters, and outbuildings that were occupied by 60–100 enslaved people during Thomas Jefferson’s lifetime. This research had a profound influence not only on our contemporary understanding of Jefferson, whose views on slavery changed over the course of his life, but on Monticello’s shift from a tobacco to a wheat plantation and on the system of slavery in the Chesapeake Bay region more broadly. Monticello’s archaeologists found substantive shifts in enslaved peoples’ living arrangements—specifically, an increase in family-based housing—and economic autonomy between 1770 and 1790. 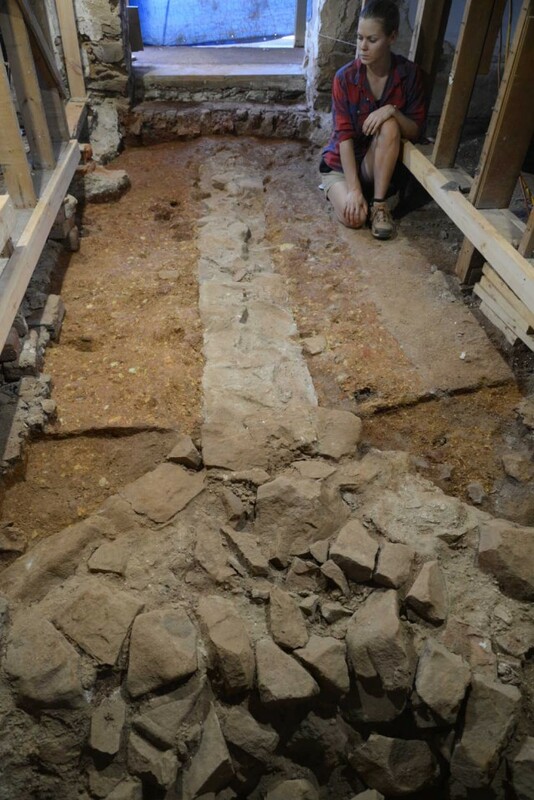 Archaeologist Lauren Gryctko inspects the foundation for a stone partition that divided a 17-by-34 foot stone dwelling on Mulberry Row into two rooms. Each room was heated by a corner fireplace supported by the triangular stone foundation in the foreground. The building was built between 1776 and 1778 to house free white workmen that Jefferson hired to build Monticello I . It later housed enslaved domestics, then free workmen again, and finally may have been used as a textile shop before Jefferson’s death in 1826. Image courtesy of Monticello.